Lots of people make New Year’s resolutions to get their personal financial situation in order, and paying off credit card debt is usually a high priority. Credit card debt is at a $1 trillion. The combination of high borrowing limits, steep interest rates and late payment fees make it extremely difficult to get under control. But let’s assume people in every state created a plan to pay 15% of their income toward credit card debt. We compiled research from Creditcards.com to understand how such a strategy would play out in every state across the country. 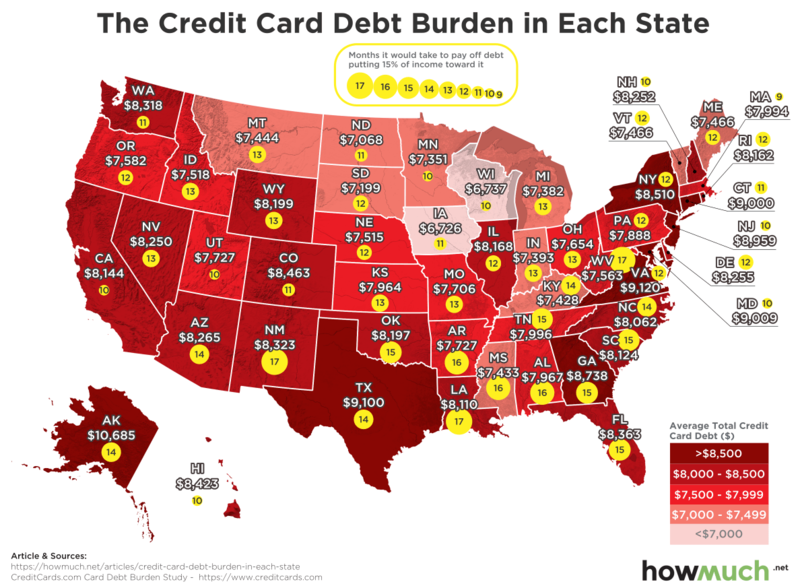 Our visualization starts with a heat map of average total credit card balances broken down by state. We then applied an average household income figure to see how many months it would take to pay off such a balance with only 15% of one’s total household income. This takes into account the compounding interest rate adding to the remaining balance each month. Of course, our analysis assumes people would stick to the plan and avoid taking on brand new credit card debt throughout the process. There are several big takeaways. First, there’s a regional trend in overall credit card balances. Dark red states like New York ($8,510), Texas ($9,100) and Alaska ($10,685) carry the biggest balances, but the Upper Midwest looks relatively financially healthy. Wisconsin ($6,737) and Iowa ($6,726) have the lowest averages in the country. Most Americans would need at least a year to pay off their credit cards, and even longer for states in the South. New Mexico, Louisiana and West Virginia have the longest timelines at 17 months each, and Massachusetts has the shortest at just 9 months. The average across all 50 states is 12.7 months, meaning it would have to be a New Year’s resolution for 2019 and 2020 for lots of people. And finally, there’s the imperfect relationship between how long it would take to pay off the debt and the total debt load. The states with the highest balances don’t necessarily need the most time. Take Massachusetts as an example, where the average credit card debt stands at $7,994 but would only take 9 months to pay off. Compare it to Iowa at $6,726 and 11 months. That’s because people in Massachusetts make a lot more money than people in Iowa. Things generally cost a lot more in the Northeast too, which makes it harder to achieve financial security too.